The Caravalhos have a theory. “Maybe it’s a brothel?” Sarah guessed. Others have speculated that Hoo Hoo might be a type of dessert or that it has something to do with ghosts. If you look up Hoo Hoo in Urban Dictionary, you’ll find it’s slang for ... a woman’s genitalia. But the meaning behind Hoo Hoo Way in Cupertino isn't any of those things. Its origin stretches back to the first green rush in California, and one very wacky group. What is a Hoo Hoo? Before we can answer what is a Hoo Hoo, we need to know who are the Hoo-Hoo. To find out, I head to a strip mall in Sacramento, where I find myself in an Italian restaurant surrounded by lumbermen. “We accept pretty much everybody in the supply chain,” says Hoo-Hoo Kent Bond. So anybody from lumberjacks and lumber barons to architects and logging journalists can be a Hoo-Hoo. On the night I visit, it’s new-member initiation. A dozen new members, who the frat calls “kittens,” are here to join the club in a ceremony called a concatenation. 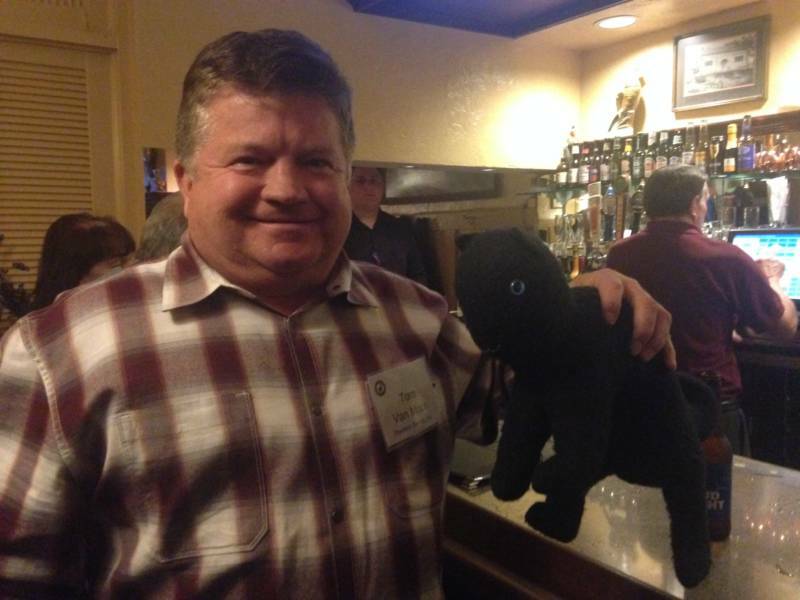 A little before the concat (a Hoo-Hoo abbreviation), Tom Von Moos walks into the restaurant bar holding the fraternal prop -- a stuffed black cat -- and leading a dozen new initiates into the room. Another Hoo-Hoo member whispers to me that the hazing isn't what it used to be. After the kittens were loosened up with booze, they were ushered toward a private room at the back of the restaurant for the concatenation. I am not allowed to follow. “It’s for members' eyes only,” Robyn Russ Beckett tells me. Beckett is the current Snark of the Universe, which means she is the leader of about 1,600 members across the globe. I have no idea what happened during the concatenation -- and Beckett wouldn’t say much -- but I did hear muffled cheers, and I suspect new members might have done something embarrassing with that stuffed black cat. 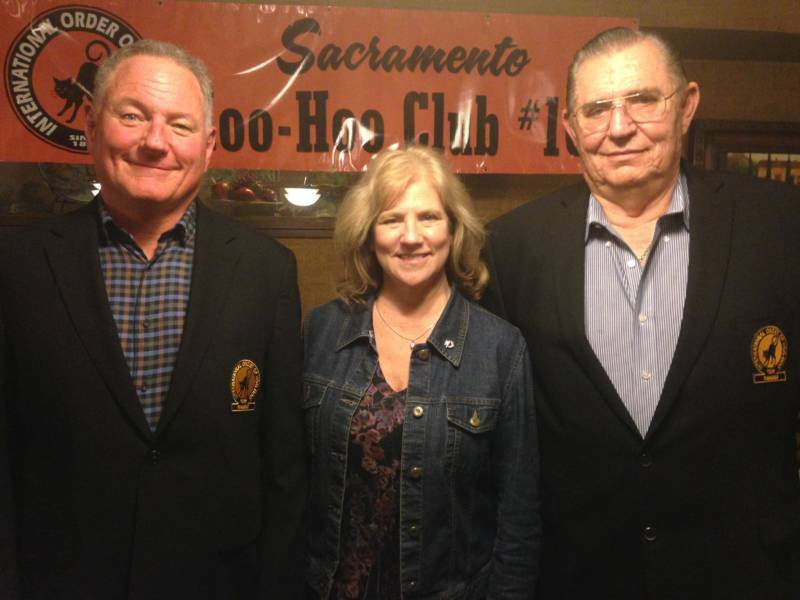 The Hoo-Hoo have been concatenating people since the group was founded after a lumber convention in 1892. Beckett did say the official outfit hasn’t changed in a while. 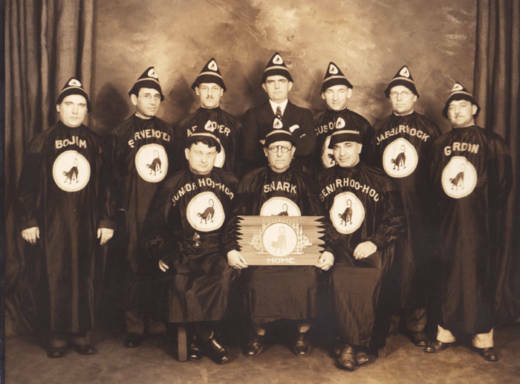 Based on old photographs, that means the Hoo-Hoo officials are bedecked in long black robes with a black cat emblazoned on the chest. Some photos show officials wearing pointy elfin-looking hats. “There’s such value to uniting the forest products industry and that’s what we do. It’s all about goodwill, fellowship, relationship-building, community service and networking,” says Beckett. They have members in the U.S., Canada, Australia, New Zealand, Malaysia and South Africa. Their fraternal symbol is the black cat because they wanted something that was unconventional and un-superstitious. They liked the black cat’s association with bad luck. The Hoo-Hoo have special names for their nine main officials. Many of the titles were lifted from the poems of Lewis Carroll. These include Snark, Bojum and Jabberwock. Other names are Hoo-Hoo originals like scrivenoter, arcanoper and custocatian, Sr. High Hoo-Hoo and Jr. High Hoo-Hoo. The title of gurdon comes from the name of the small town where the founders of the Hoo-Hoo first met while waiting for a train. For example, various clubs in the Hoo-Hoo have a tradition of giving gifts to visiting leaders. These gifts include hubcaps and toilet seats. And as for where the word Hoo-Hoo comes from? “One of the founders had a good friend that had a tuft of hair that he would oil and twist and it would stand up on his head, and he coined it a Hoo-Hoo,” said Beckett. Early members used the term Hoo-Hoo for anything that was slightly out of the ordinary. An odd hat was a Hoo-Hoo, a good poker hand was a Hoo-Hoo and a chicken wearing pants would have certainly been called a Hoo-Hoo. How Did Hoo Hoo Way Come to Cupertino? To understand this, we need to go back to San Francisco during the 1915 Panama-Pacific International Exposition, also called the 1915 World's Fair. In those days, the World's Fair showcased all the wonders of modernity and brought far-flung cultures and wares to those who couldn't afford to travel. The fair coincided with a time when the California Hoo-Hoo were riding high. 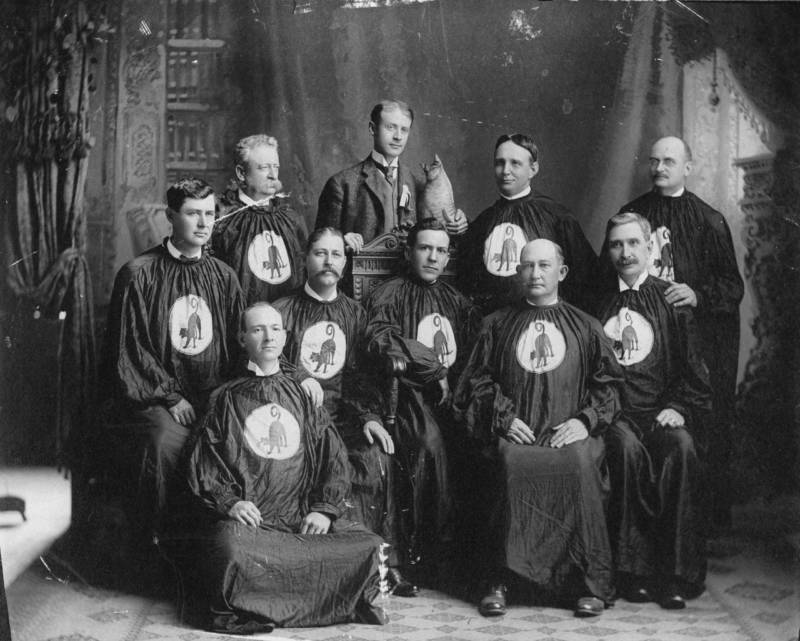 They had 10,000 members, and in 1905 had reached such prominence that President Teddy Roosevelt was honorarily concatenated. 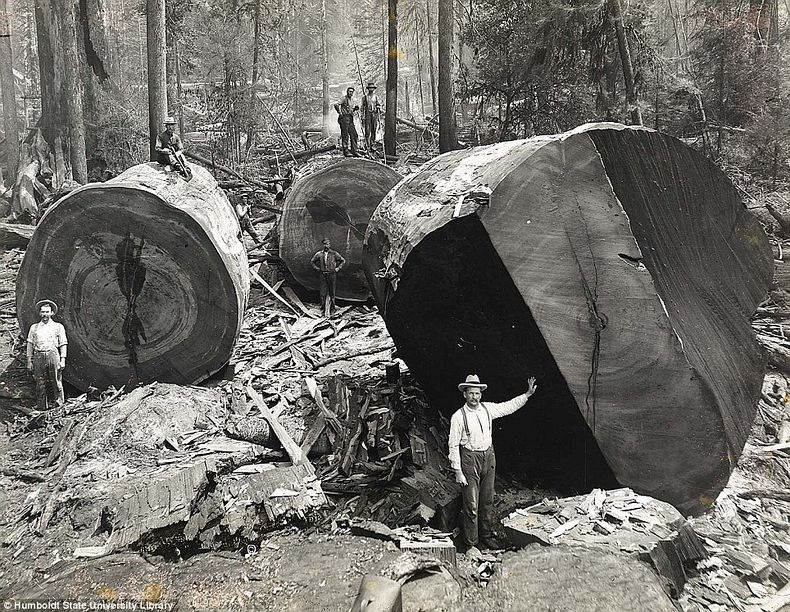 “In the two decades straddling 1900, loggers felled roughly one-quarter of all mature sequoias in California,” wrote Jared Farmer in his book "Trees in Paradise: A California History." Furthermore, the redwoods were some of the best lumber anyone had ever seen and just one tree could supply enough wood to build 20 houses or one large building, such as the Church of One Tree. Most of that lumber being cut was destined for San Francisco, which at that time should have been called the Wooden City, according to Farmer. Before the 1906 Earthquake and Fire, 90 percent of the buildings were made of lumber, the highest percentage of any U.S. metropolis. 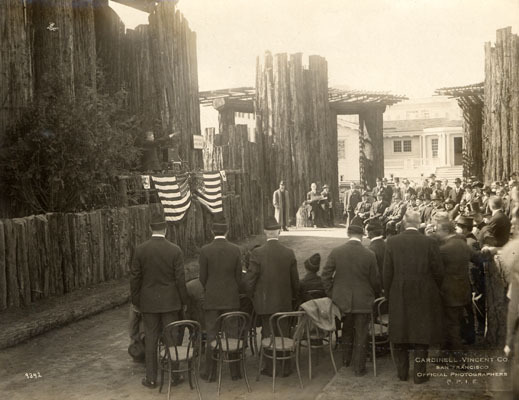 After the fire and before the groundbreaking of the Panama-Pacific International Exposition, 89 percent of the 28,507 new buildings had wooden frames. Mills had to work overtime to keep up with the demand. As heavy hitters of that time and place, the Hoo-Hoo wanted to be represented at the fair. 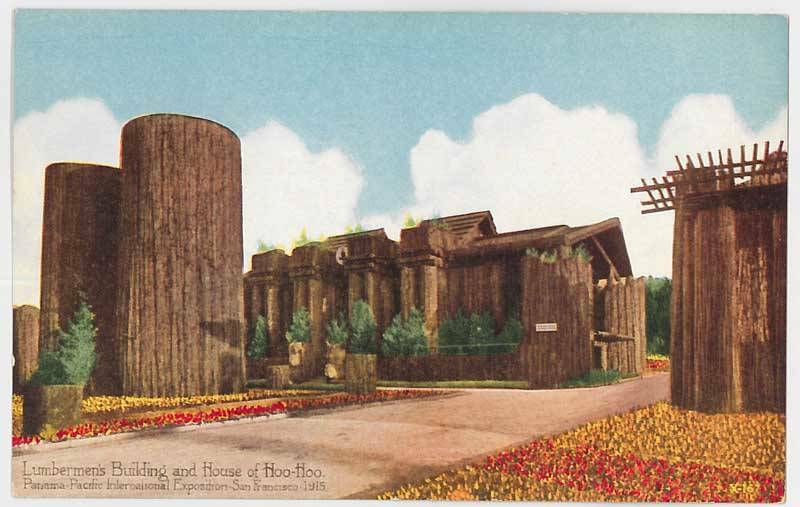 "The House of Hoo-Hoo was the only building constructed by a fraternal organization on the entire 635-acre exposition grounds," says Laura Ackley, author of "San Francisco's Jewel City, The Panama Pacific International Exposition of 1915." The Hoo-Hoo commissioned Bernard Maybeck, architect of the Palace of Fine Arts, to design a magnificent house for the fair. "The building was meant to promote the use of Western lumber and to provide hospitality for visiting lumbermen, and encourage social interaction so they could develop professional relationships," says Ackley. 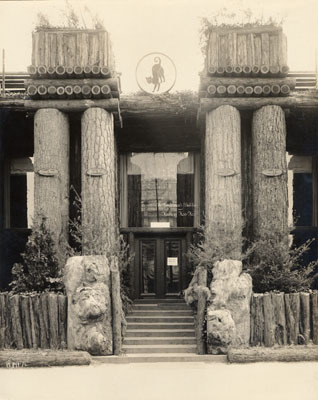 Maybeck used huge tree trunks as columns outside the building. Rough bark still clung to the wood and was meant to remind visitors of a forest. Inside, an assortment of rooms showcased the uses of all sorts of Pacific coast woods. The building had amenities, including a mail clerk, a stenographer, a telephone (new at the time), a ladies' retiring room and a room for men to sit and read the paper. There was also a great hall for celebrations and rituals. The House of Hoo-Hoo held a concatenation on the ninth hour of the ninth day of the ninth month of the fair -- all an homage to the nine lives of the cat. According to Ackley, the opening was attended by a cat named Panama, the "official exposition cat," which undoubtedly was a good omen for the Hoo-Hoo. The House of Hoo-Hoo was mostly closed to the public, though on the few days it was open, about 25,000 visitors toured the place. When the fair ended, many of the buildings were torn down, but not the House of Hoo-Hoo. It was bought by a rich man unaffiliated with the Hoo-Hoo organization. 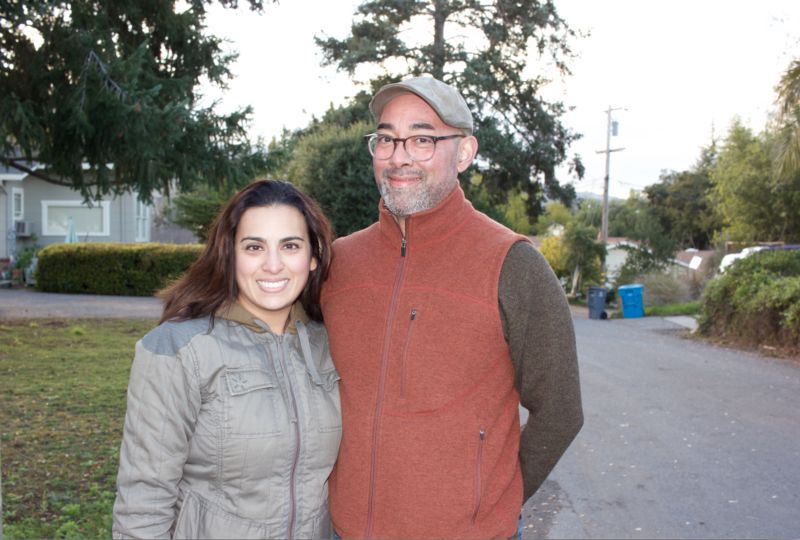 He had the building disassembled, put on a barge and shipped down to Monta Vista, or modern-day Cupertino; close to our question-askers, the Caravalhos, and a road that would eventually become Hoo-Hoo Way. The building was supposed to be used as a community center but ended up as a kind of roadhouse, with lots of dancing and drinking (before prohibition was enacted). The establishment was considered unsavory at the time. Despite protests by the Hoo-Hoo, the new owner kept the name and symbols of the Hoo-Hoo. A large black cat still hung over the doorway and was used in newspaper ads. The Hoo-Hoo didn’t appreciate the appropriation of their name and traditions, but it would soon become a moot point. On Aug. 15, 1926, the House of Hoo-Hoo caught fire and burned to the ground. "It was said to be defective wiring, but we will never know," says Ackley. By that point the hill that the House of Hoo-Hoo sat atop was being called Hoo-Hoo Hill, and the street nearby was -- you guessed it -- Hoo-Hoo Way. Editor's Note: Hoo Hoo Way has been replaced by a street sign that reads Carmen Road.